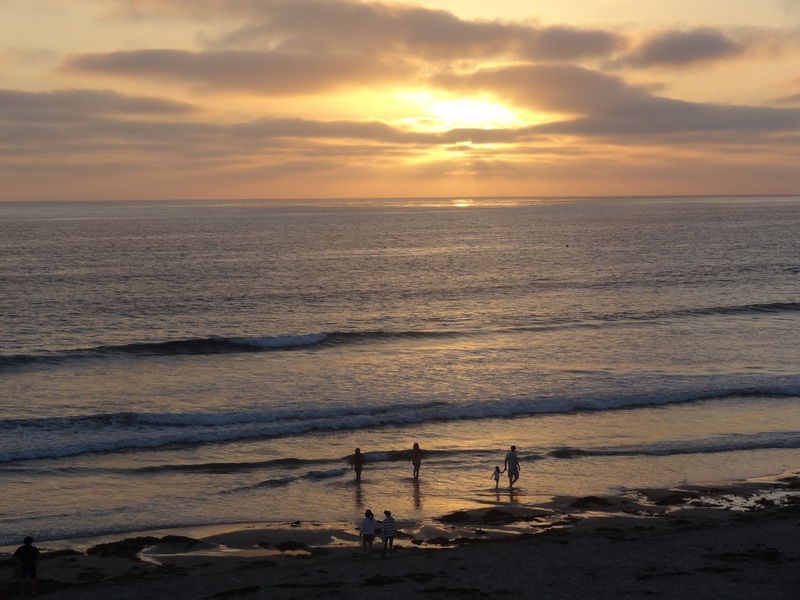 I ditched the nursery for a couple of days as my wife and children have developed a penchant for vacationing in San Diego, especially for swimming in the ocean. 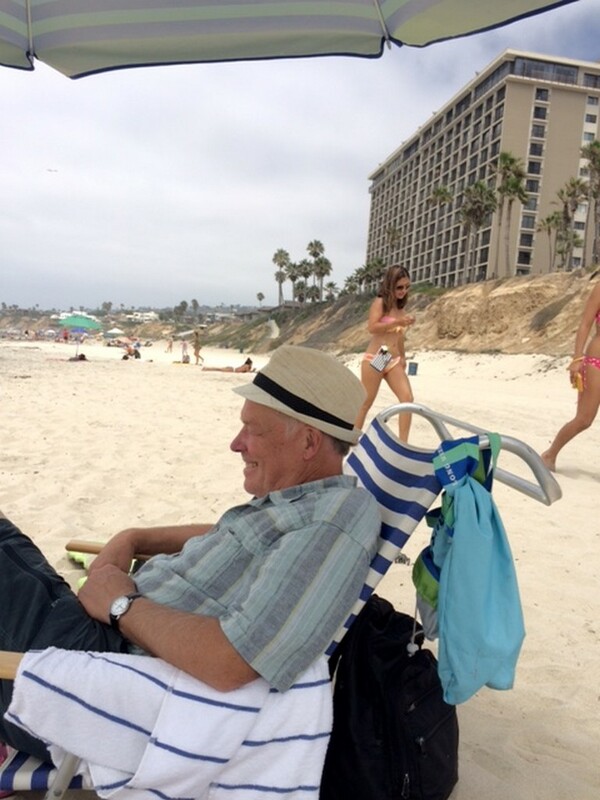 I intended to write the blog while there, but beer and margaritas got in the way. 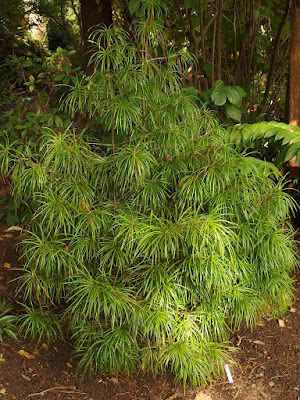 The flora was sparse, with palm trees and gardenias, but there was a nice stand of Pinus torreyana at the aquarium. San Diego must be the bikini capital of America, speaking of sparse, and my wife finally asked, "Why do you pretend that you're not looking, when you obviously are?" 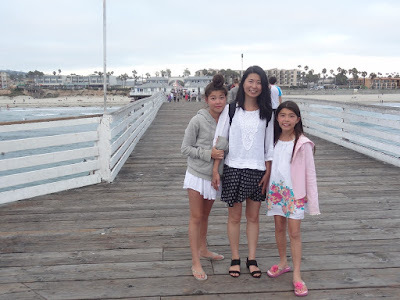 I'll confess that nothing of lasting value came from the four day – all I could afford – trip, except the memories of my happy children riding the waves on their boogie boards. Gordon dedicates his work to “The Most Noble Algernon*, Duke of Northumberland,” who perhaps financed the endeavor just to see his name in print. But I speculate. Gordon makes sure that the reader is aware that Algernon is “A great admirer of hardy trees, the cultivation of which in England has been much influenced by the many fine specimens in his Grace's park and pleasure grounds.” Gordon defines himself to the Duke as “his obedient and humble servant.” It would be vain of me to suggest that Seth and my other employees refer to me as such, as they actually consider me to be lucky that they show up at all. 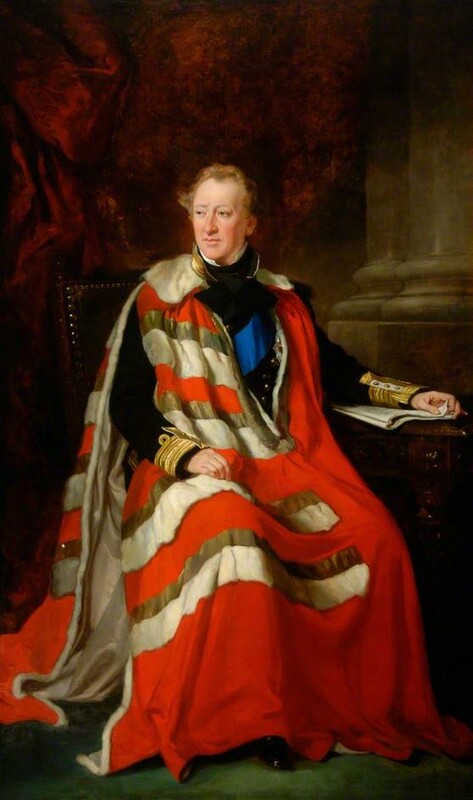 *Admiral Algernon Percy (1792-1865) was the 4th Duke of Northumberland. He entered the Royal Navy at age 13 and served in the Napoleonic Wars, and in 1853 he was made a Knight of the Garter, a dynastic order with the motto of “Shame on him who thinks evil of it.” One legend has it that the Countess of Salisbury was dancing at a court ball when her garter slipped from her leg. While others laughed, the king picked it up and returned it to her – a most chivalrous act – hence the motto. 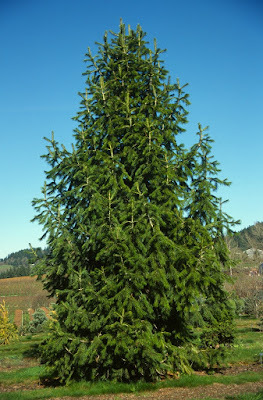 In Gordon's introduction he gives credit where it is due, informing his readers that “the most gigantic specimens (of conifer) exist in California, and on the North West Coast, “where the dimensions of some appear almost fabulous.” He cites the example of the newly-discovered Wellingtonia Lindley, the “Mammoth Tree.” Synonyms of Wellingtonia include Sequoia gigantea Endlicher, Washingtonia gigantea of the Americans, Americanus giganteus, Hort Amer and Taxodii sp. Douglas. 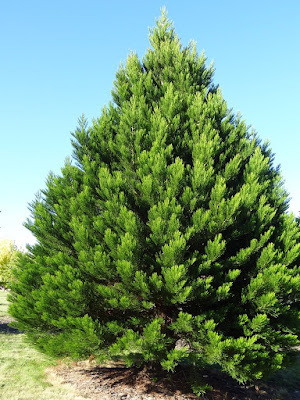 I'm glad that Americanus didn't stick, and even though I always cheer for America in the Olympics, the thought that the largest tree on earth could be named for an Italian sailor who never set foot on North America seems preposterous. But what's with Taxodii sp. Douglas? Who is this Douglas? 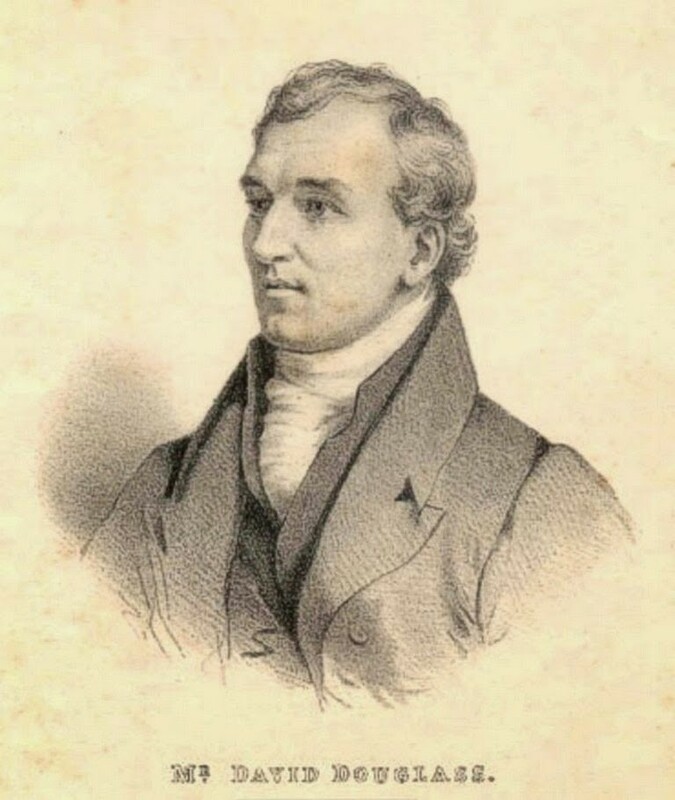 The mind leaps to David Douglas (1799-18340, the renowned Scottish plantsman who worked in the Pacific Northwest and California. But he never saw the “Giant Sequoia,” the “Mammoth Tree,” for he died years before they were discovered. 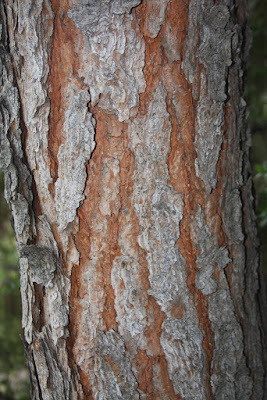 In 1833 the explorer J.K. Leonard mentioned in his diary of an encounter with “big trees,” but nothing was publicized, and later in 1850 John Wooster supposedly carved his initials in the bark of a tree in the Calaveras grove, but again this received no publicity. Finally in 1853 Augustus T. Dowd, a hunter chasing a bear, stumbled upon the giant redwoods, but nobody back at camp would believe him...at first. William Lobb, working in California for the English Veitch Nursery, heard about the new discovery and dashed immediately to collect seed, and he left for home in 1853 without notifying any American botanists. 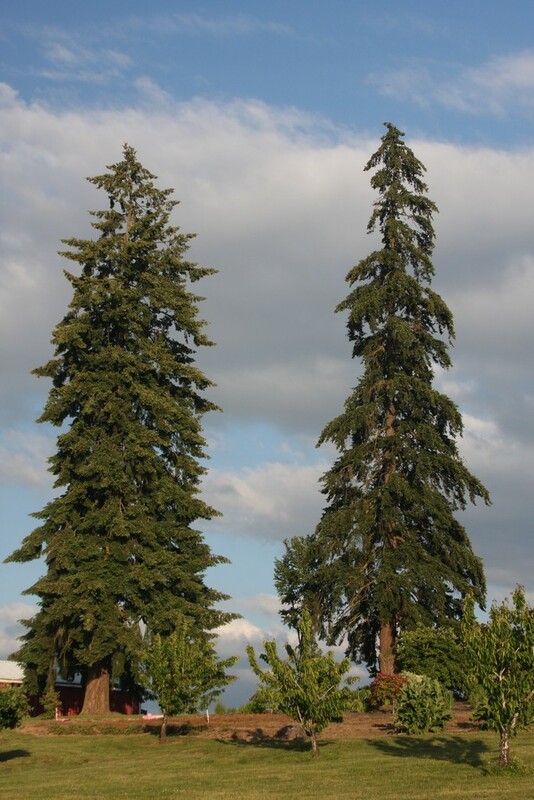 They were outraged that the world's largest tree would be named after an English war hero who had never even seen the tree, but then the Frenchman Joseph Decaisne published the name in 1854 of Sequoia gigantea – which stuck for years. Of course local Indian tribes had known of the trees for centuries, and they referred to them as Wawona, which imitates the sound of the northern spotted owl, their guardian of the forest. 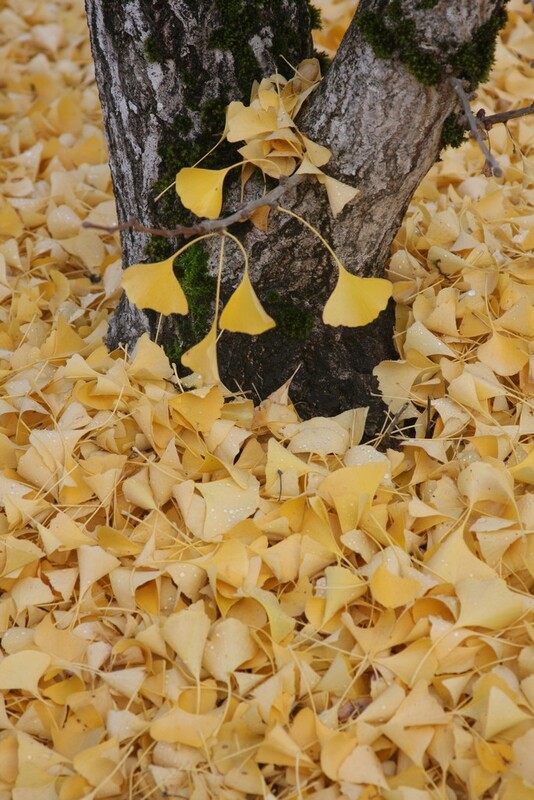 Previously I mentioned the Countess of Salisbury, but she had nothing to do with the English botanist James Edward Smith who referred to the Ginkgo as Salisburia adiantifolia, the “Maidenhair Tree.” Smith was honoring R.A. Salisbury, F.R.S. 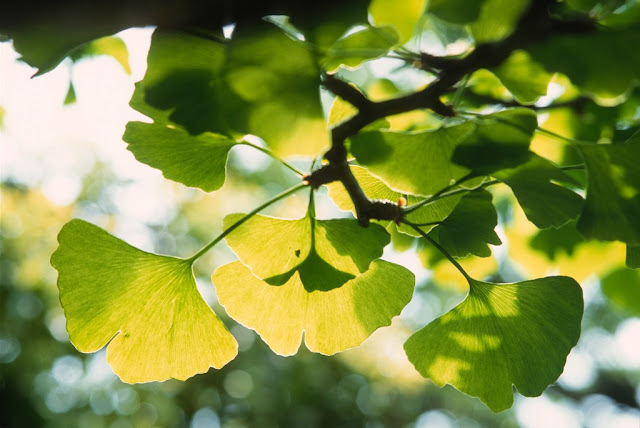 *, an eminent English botanist, though George Gordon acknowledges in The Pinetum that a synonym of Salisburia is Ginkgo biloba, Linnaeus. He also mentions Professor Bunge – of Pinus bungeana fame – “who accompanied the Russian Mission to Pekin [sic] and states that he saw an immense Ginkgo with a trunk nearly 40' in circumference, and of prodigious height, but still in perfect vigor.” Gordon also lists “varieties” of Ginkgo, with laciniata, Carriere, macrophylla, Reynier and variegata, Carriere. 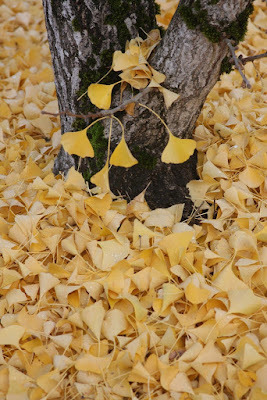 I have seen Ginkgo in the wild – dead ones – when I visited the Ginkgo Petrified Forest State Park in eastern Washington along the Columbia River. 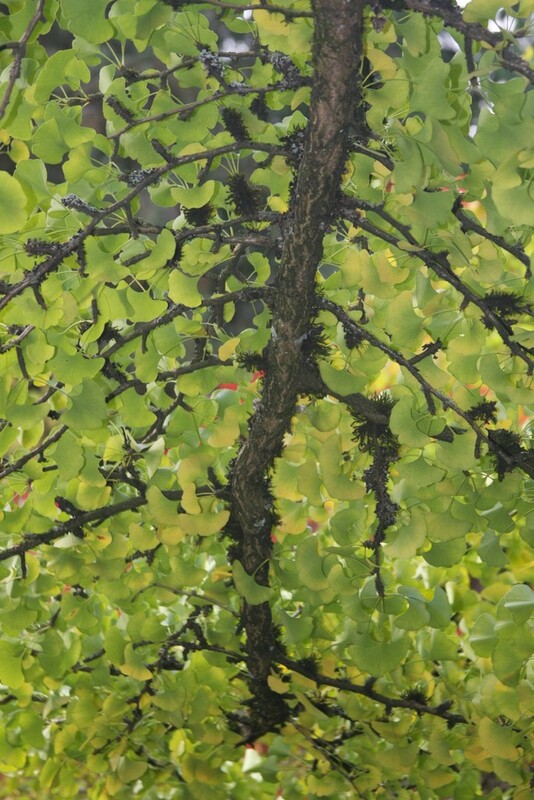 Petrified Ginkgo wood was discovered in the 1930's, along with the remains of Nyssa, Sequoia, Pseudotsuga, Picea, Magnolia, Acer, Hamamelis and more. *F.R.S. stands for “False Ring Syndrome,” as in when a person thinks his cell phone is ringing but it isn't; or more likely, in Salisbury's case, a Friend of the Royal Society. Gordon continues with a review of Sciadopitys, the Japanese “Umbrella Pine,” which of course is not a true pine. 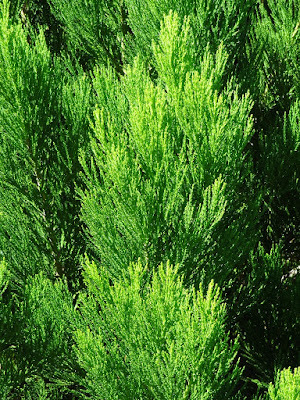 He says that the name is derived from skidos for “shade” and pitys for “pine,” but today the Greek etymology suggests sciado for “shadow” and pitys for “pine.” He describes it as “A large shrub or small tree, found on the mountains in Japan, but even there very rare,” and later “The Chinese call it 'Kin-Sung' and the Japanese 'Koja-Maki', and plant it in their gardens and around their Sacred Temples, but it is by no means plentiful or abundant in Japan, where, according to Dr. Siebold [Phillip von Siebold, who first described it], there are several varieties.” Keep in mind that a “variety” is what we would today call a “cultivar,” or cultivated variant. There exists a large specimen at Junguji Temple in Kyoto Prefecture that measured 27 m tall (88.5') with a girth of 4.1 m (13.5') in 2000, and records show that it has been worshipped locally since 1310. 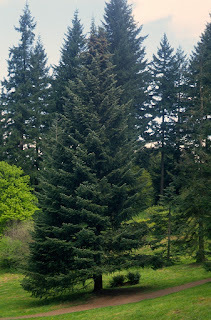 The largest Umbrella pine I have ever seen is surprisingly in my home town of Forest Grove, Oregon, and it is located only three blocks from where I grew up. Of course it meant nothing to me as a youth, but later I was told about it by the late Dr. Bump who had two progeny, good-sized, in his yard. 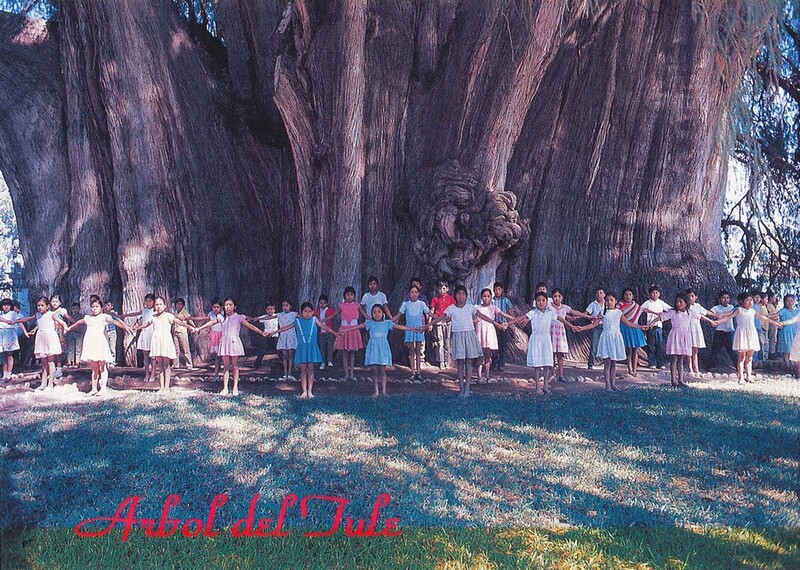 *Apparently DNA tests confirm that it is indeed one tree, but it could be comprised of multiple trunks from one tree. 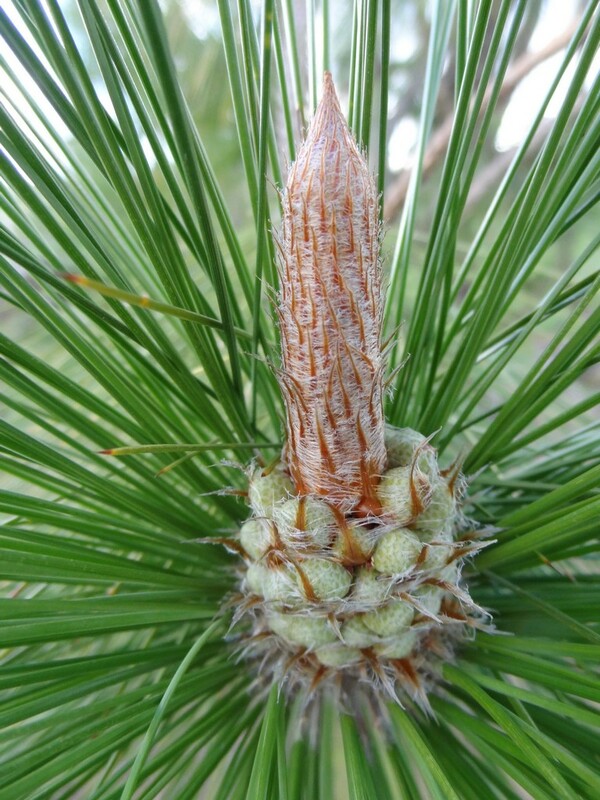 I was curious about Gordon's listing of Pinus mitis, Michaux, for I had never encountered such a species. 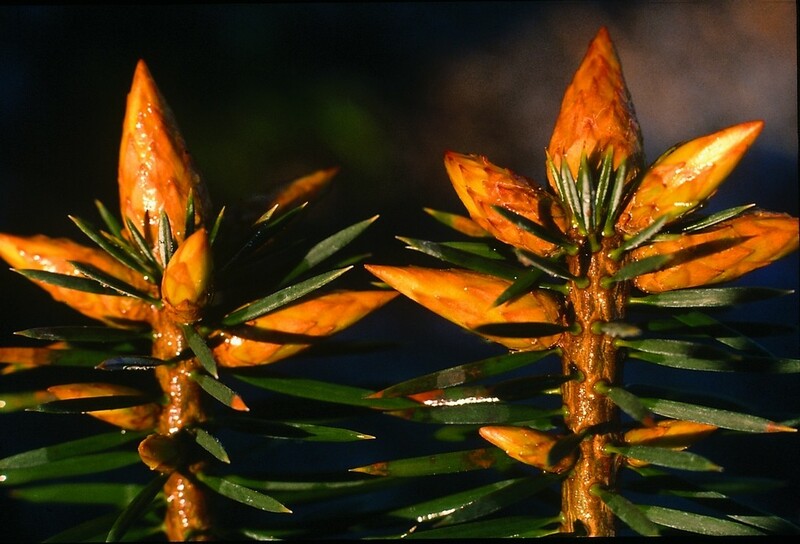 The puzzle was solved when I considered Gordon's synonyms: Pinus variabilis, Pursh, lutea Loddiges, Roylei, Lindley, intermedia, Fischer and echinata, Miller. Ah, echinata! For some reason unknown to me, the mitis specific name was eventually changed to echinata. 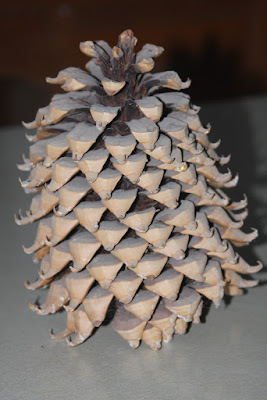 Mitis is a Latin word meaning mild, meek, gentle, placid or soothing, while echinata means prickly, referring to the cones. I have two P. echinata planted in our waterfall section, now about 34 years old. They were purchased as rooted cuttings (!) from the now-defunct Mitsch Nursery of Oregon, a wonderful company for me when my nursery was in its infancy. As I gaze at my trees, they don't strike me as mild, meek etc. 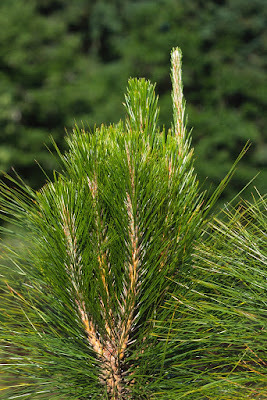 at all, unless the rather thin green needles struck the namer (Miller) of the species as harmless. And now, at about 40 feet tall, I would describe them as scrappy, but at least the open canopy allows for perfect shade beneath. As for the cones, I wouldn't describe them as "prickly," but rather the opposite; and I don't know what the English botanist, Philip Miller (1691-1771), had in mind when he named the species. Miller was the chief gardener at the Chelsea Physic Garden, and he penned The Gardener's Dictionary, and my copy (published in the 1700's) is the oldest book in my library. 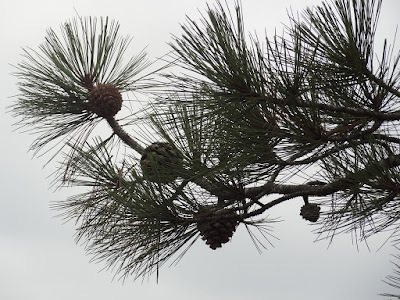 Gordon's "Pinus macrocarpa, Lindley, Dr. Coulter's pine" initially puzzled me, for he lists synonyms of Pinus coulteri, Don, Pinus sabiniana macrocarpa, Hort and Pinus Sabina Coulteri, Loudon. 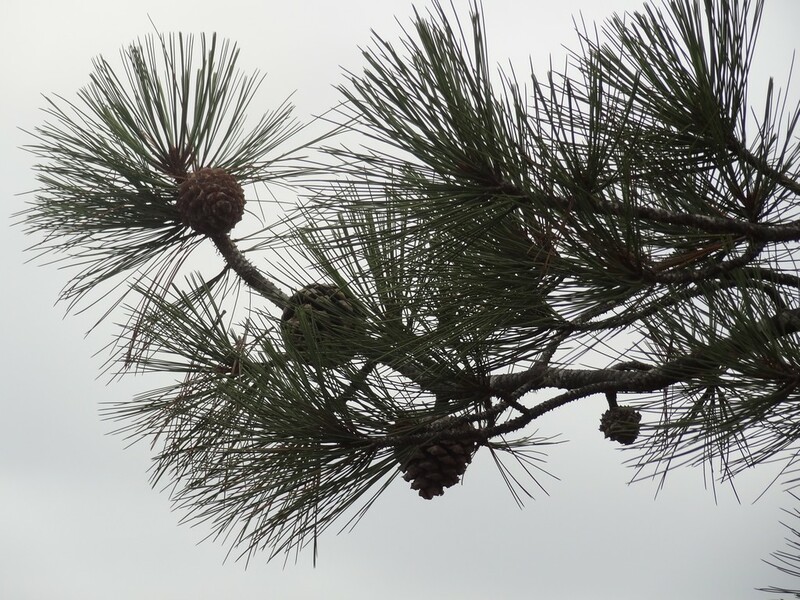 In today's world we have Pinus sabiniana and Pinus coulteri, both with huge cones, both from California, but two very different-looking trees, so which species is Gordon describing? 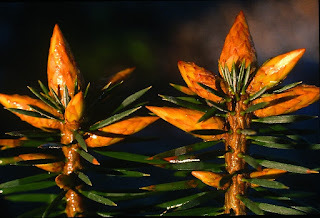 He reports that "Leaves, in threes, stout, and rather stiff, from ten to twelve inches long...," I was certain that the mysterious species was coulteri. 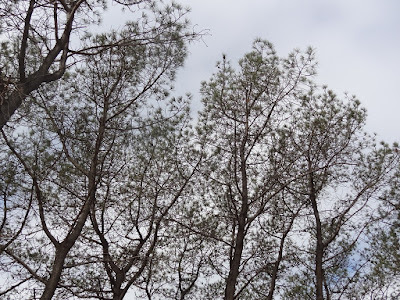 But in the same sentence he calls the needles "of a glaucous grey color," which would be Pinus sabiniana, for I would describe coulteri as less glaucous. Confused? 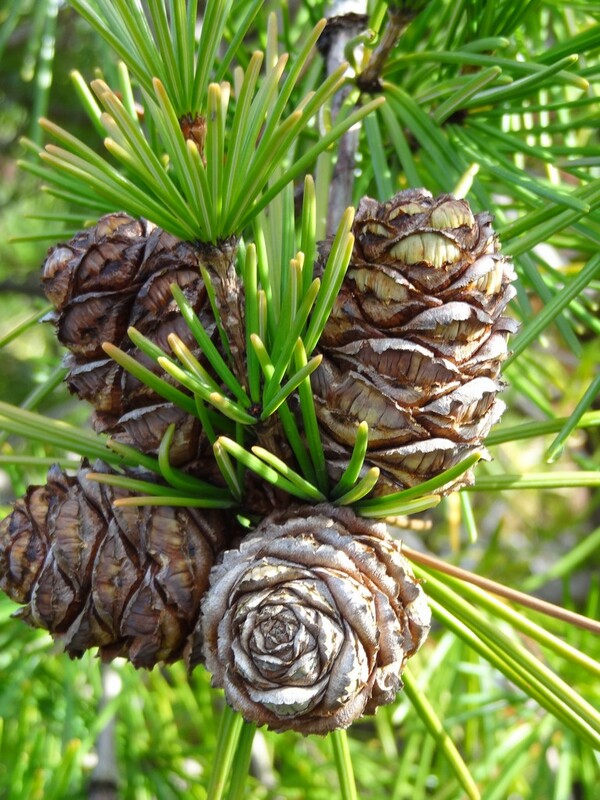 What settled the matter was the pine's native range, with Gordon's "found on the mountains of Santa Lucia...within sight of the sea, at an elevation of from 3,000 to 4,000 feet." I've been there – it is also home to the "Bristlecone fir," Abies bracteata – so now I know he was describing Pinus coulteri. Hey, I hope you are having as much fun trying to decipher Gordon's trees as I am. 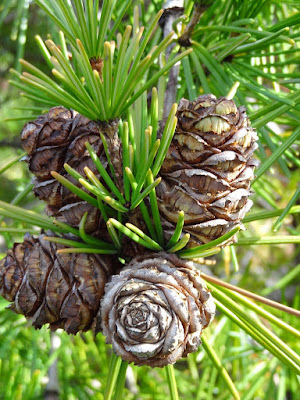 I know that "Pinus ponderosa, Douglas, the Heavy-wooded Pine," is indeed the species that David Douglas introduced into England in 1826. I don't know if Douglas ever lifted a ponderosa log – he never worked in a sawmill – and I always assumed that he named the species for its magnificent size. 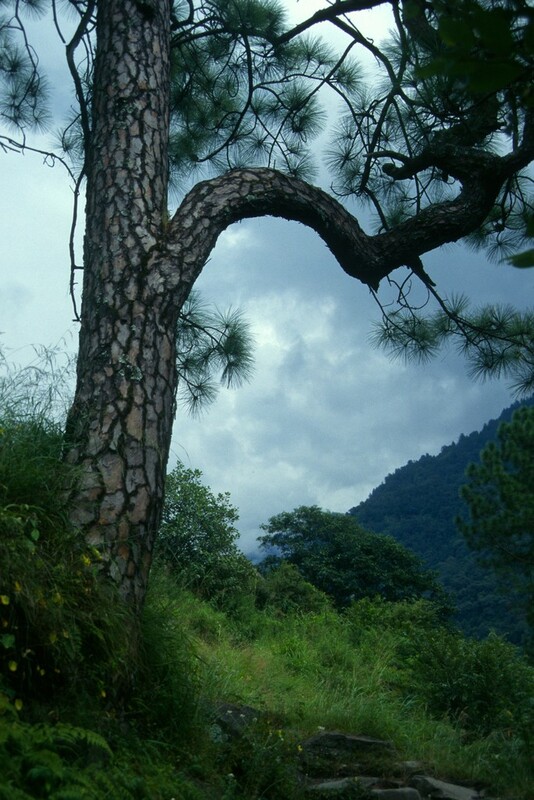 Ponderosa is from Latin ponder meaning "weight," then later to "weigh" or "reflect on" and finally to Old French "to appraise" or "judge the worth of." 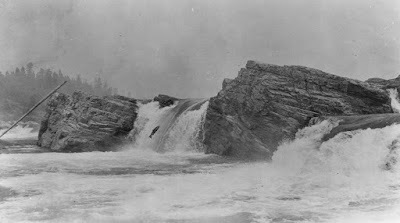 Gordon says that ponderosa "is found abundantly on the North-west coast of America, and in California, particularly on the banks of the Flathead and Spoken [sic] Rivers, and the Kettle Falls of the Columbia..." That account is confusing for a number of reasons. First, P. ponderosa is not native to the North-west coast, but rather inland in the drier regions. Also, the Spokane River is in Idaho and Washington state, not California, and Kettle Falls is/was* in Washington state near the Canadian border. One must forgive Gordon for any errors about America's geography since he never set foot in America, and most of his information in the book was from examining his Grace's trees or the herbarium, or from second-hand reports. *Alas, Kettle Falls – also sacred to the Native Americans – was drowned with the building of the Grand Coulee Dam, and now resides 90 feet underwater in the created Lake Roosevelt. Many conifers were once classified as Pinus, including Pseudotsuga, and I have an antique drawing of one from 1855, just after the name had been changed to Abies. 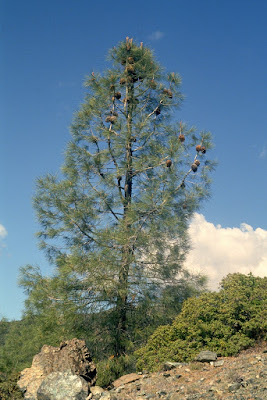 In Gordon's work, he called it Abies Douglasii, Lindley, with synonyms of Abies Californica, Don, Picea Douglasii, Link, Pinus Douglasii, Sabine, Pinus taxifolia, Lambert and Tsuga Douglasi (with one i), Carriere. 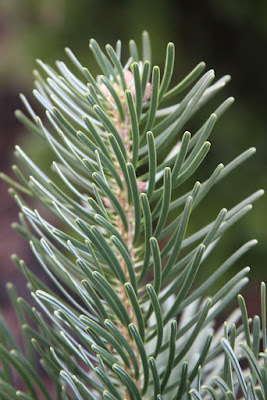 He refers to specimens from Mexico to be Abies Douglasii taxifolia, Loudon, and calls it a "very distinct variety with much longer leaves..." The Mexican version is now known as Pseudotsuga lindleyana and it extends as far south as Oaxaca. It receives special protection due to decline from inbreeding depression, the reduced biological fitness in a given population caused by the breeding of related individuals. 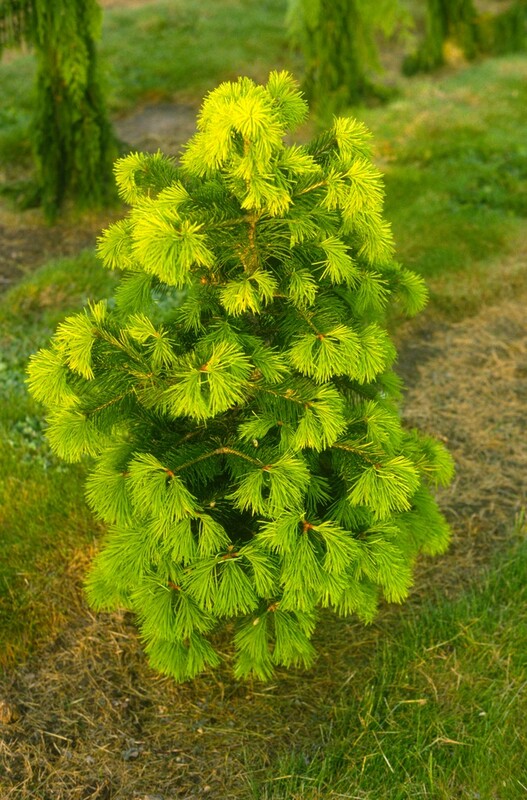 The Pseudotsuga at my nursery are P. menziesii var. 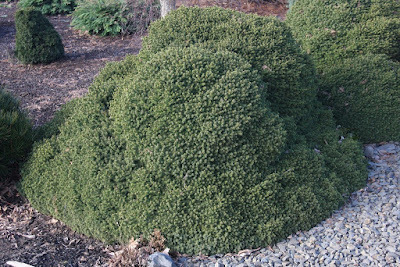 menziesii, and I have bragged about the two monsters at my home in previous blogs. I don't think I've mentioned a remarkable sight that occurs on frosty mornings, when two shadows from the winter sun are cast about three football fields long. The shadows don't thaw, but the rest of the field does. 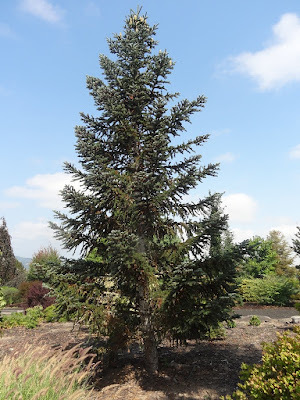 Please don't think that I am being mean-spirited to pick apart The Pinetum for its errors, but I get a special kick out of his Picea bracteata, now classified as an Abies. 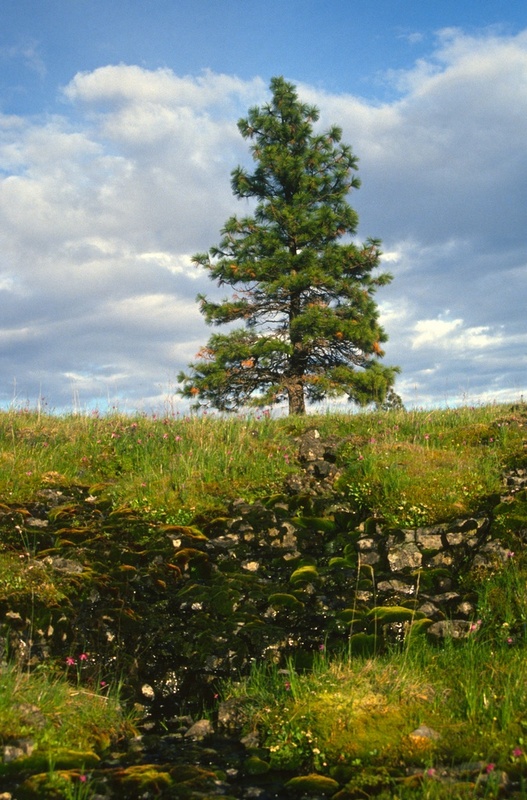 Gordon claims that it was discovered by Douglas – rong, as Douglas never ever saw it – but also that it is native along the Columbia River as well as on "the sea range of Santa Lucia in Upper California." 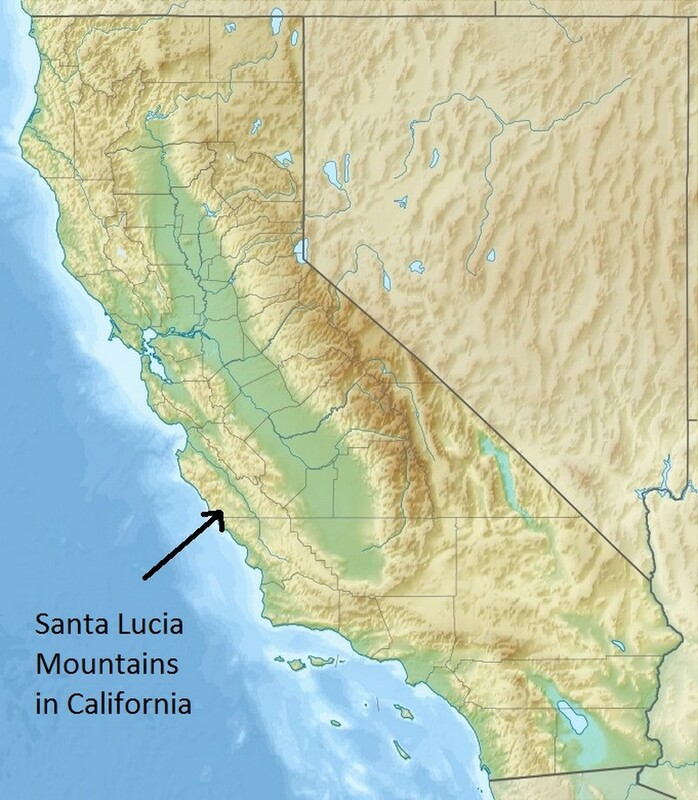 Actually I would call it central California, as they occur about four/seventh's of the way south of the Oregon border, but certainly never along the Columbia River. I used to subscribe to American Forests, and was intrigued in the spring 2004 issue (for $3.00) of the National Register of Big Trees. I learned facts about the "champion" trees, such as Persea americana's (Avocado tree) 185" circumference, 72' height and 59' spread. The champion Acer macrophyllum – now dead – was 419" in circumference, 101' in height and a spread of 90'. In the same issue was a story entitled Empty Thrones, where 94 species were without a champion, and we readers were encouraged to set out and find them. 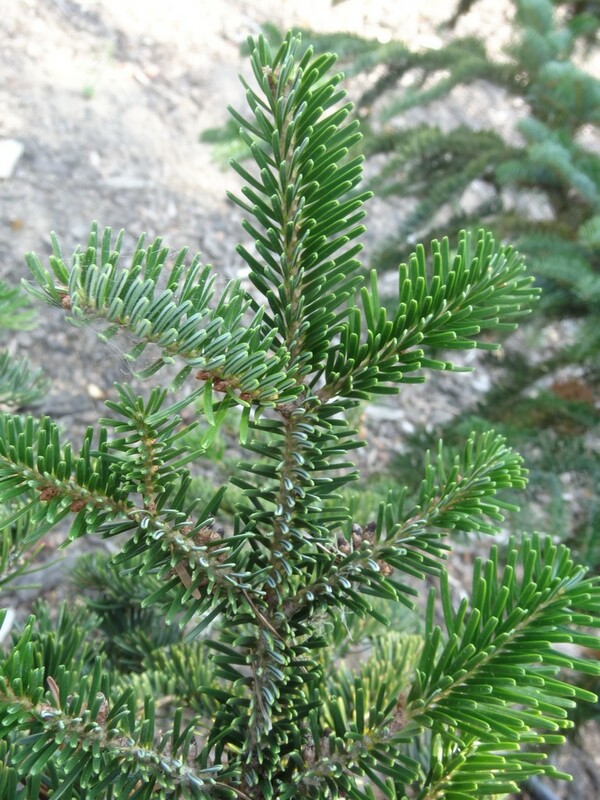 Surprisingly there was no champion for Abies bracteata, but absolutely bizarre was that it was listed as native to California, Idaho, Oregon and Colorado. I sent a letter to the editor about the error, but received no response, nor was there a correction in the next issue. I wrote again, and referred to my previous letter, but still no response. The error continued in the spring 2006 issue, and in disgust I dropped my subscription. The late van Hoey Smith from the Arboretum Trompenburg in Rotterdam considered any collection of trees without correct identification as "invalid." 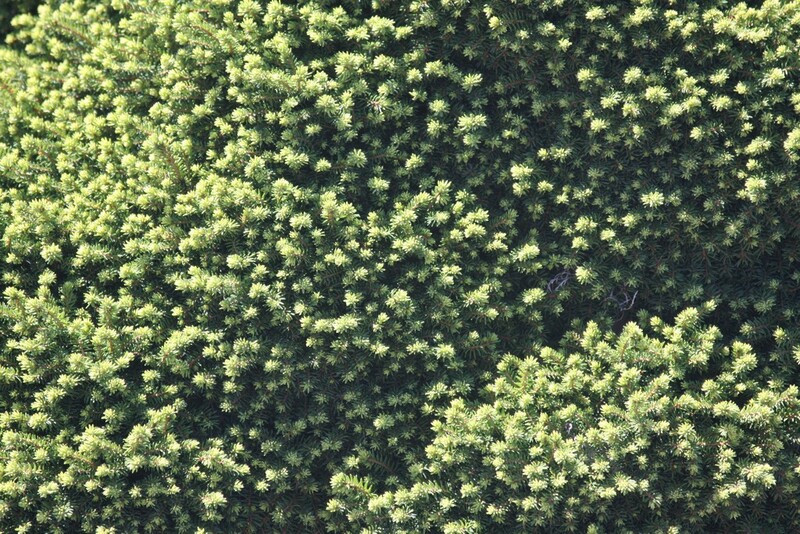 American Forests, then, was also invalid. "Write us!," you say in American Forests forum. Well, I did write to you about factual contents from a past issue. I was disappointed to receive no response. What's up? A copy of that letter is enclosed. I am a wholesale nurseryman. Among the trees I grow is the "Bristlecone fir," Abies bracteata. 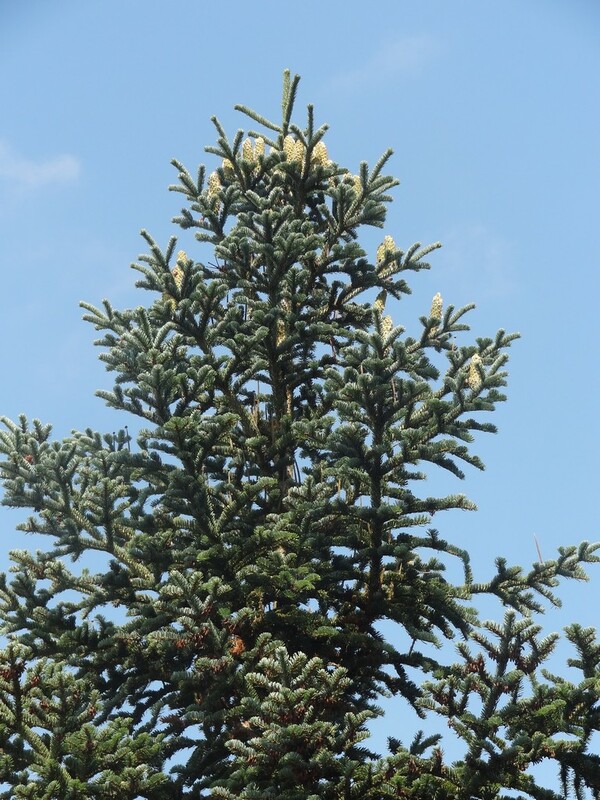 I noticed in your spring 2004 issue (which lists the national register of big trees) that Abies bracteata is a species in search of a champion. And you list its range as being Colorado, Idaho, Oregon and California. 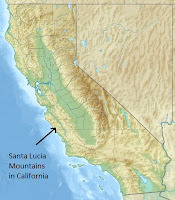 All modern reference books list it as only coming from the Santa Lucia Mountains of California, where I have observed it in the wild. Does it really also come from these other states, or is that a mistake? If so, where in these states? If it is a mistake, then an interesting one. 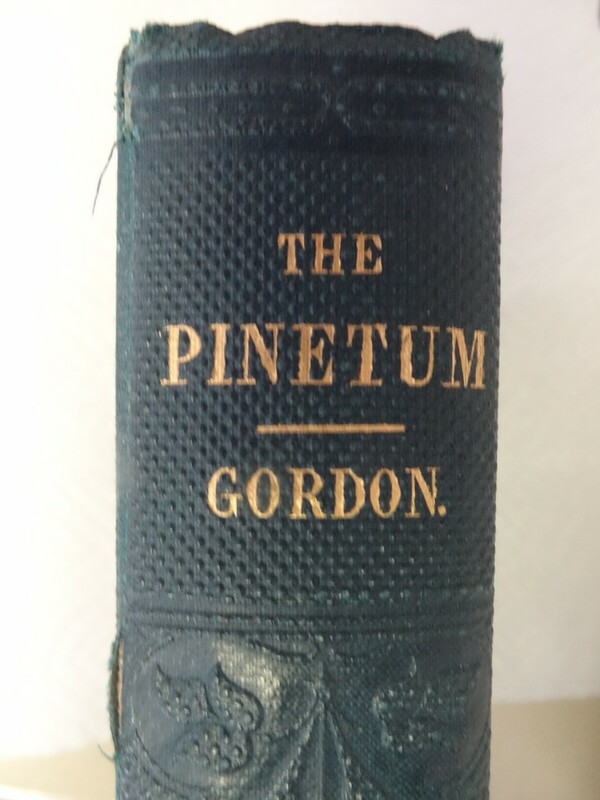 I have a copy of a conifer book by the Englishman, Gordon: The Pinetum, published in 1858. He describes Abies bracteata as "first discovered by Douglas, on the mountains of the Columbia River, and afterwards by Dr. Coulter and Hartweg, on the sea range of Santa Lucia..." I always assumed the Oregon reference was an old mistake for another species; but maybe not. 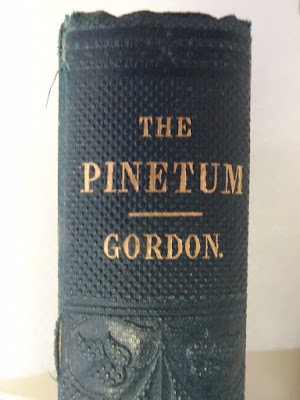 A 2nd edition to The Pinetum was published in 1875 but I have not seen it. I think it would be interesting to compare it with the original, to see if corrections were made, and if additional information was provided. By the way, some of you would find my library to be fascinating, and any valid individual is invited to visit, with priority going to attractive, witty females. But you can't borrow anything; I've learned that rule the hard way. 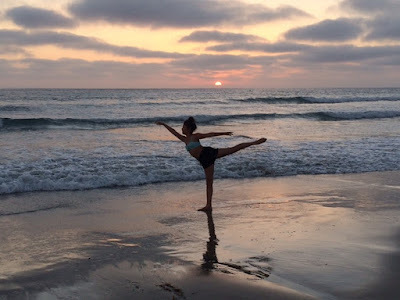 I've griped a number of times in the Flora Wonder Blog about our brutally hot summer, and as of today we will set a record for the number of days in the year where temperatures soared to 90 degrees and above. I don't know if there is any connection, but a couple of old specimens in our Blue Forest were edited by the mortal fates, even though they have been through many hot summers before. The oldest tree to perish was an anchor in the scape, a 50 year old Pinus cembra 'Glauca' that had been rescued from a stock row at the Dutchman's nursery where I used to work. 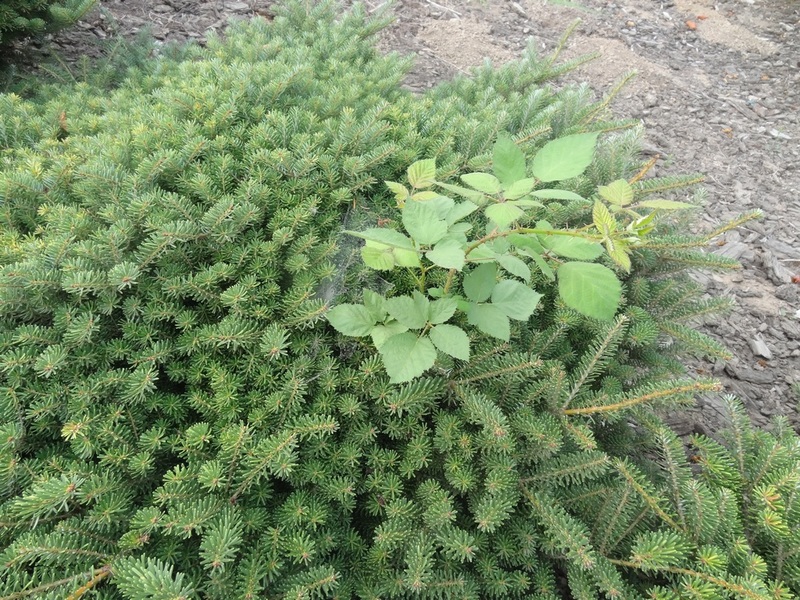 “Rescued” in the sense that this nurseryman let his plants grow together instead of cutting down every-other tree, or better yet, by harvesting from the row and increasing sales. I asked him about it, but his response was that “the trees have already paid for themselves many times over (for scionwood).” Maybe so, but what's wrong with them paying even more? It seemed like careless management to me, especially since he had an East-Coast market for them. In any case our Oregon Association of Nurseries enshrined him into their Hall of Fame, an honor that I'll never sniff, nor would I serve if elected. The Dutchman's son had an enormous round head with blonde hair, and he was fond of saying, “If you're not Dutch, you're not much.” I learned a lot at this nursery...about what not to do. 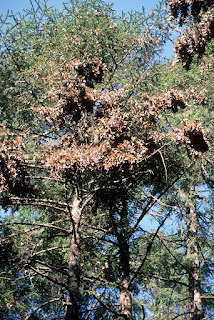 Back to the dead pine, it began to look “off” in May, then progressively worse until my edict for removal at the end of July. So long, farewell, thanks for the memories. 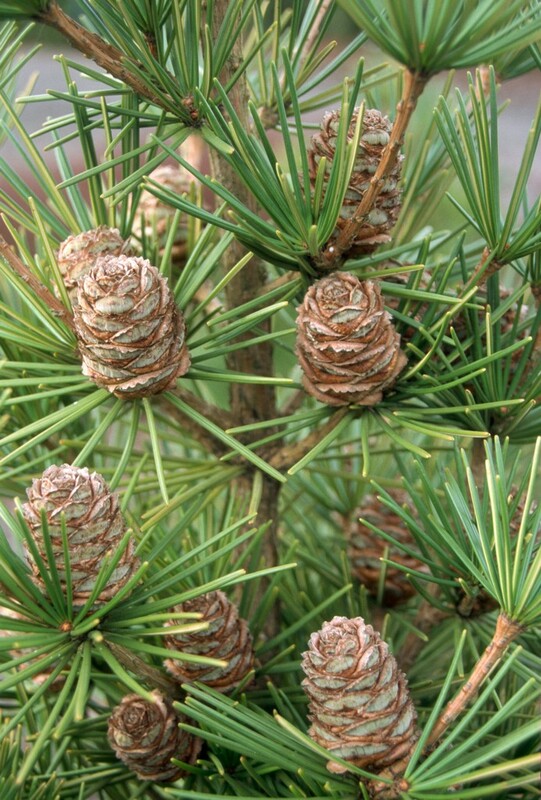 The good news is that I still have two more of the Dutchman's pines in another location, and they both look fine. 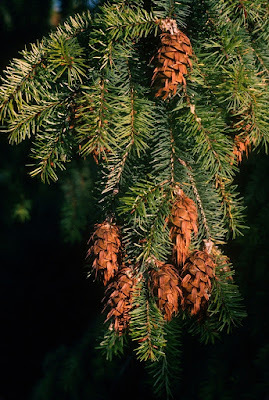 Even more disheartening was the loss of an Abies cilicica which was about 33 years old, and it went from fine to dead in about a week. Abies are like that – I've seen it before – and it's a reminder that the genus is not native to our Willamette Valley of western Oregon. 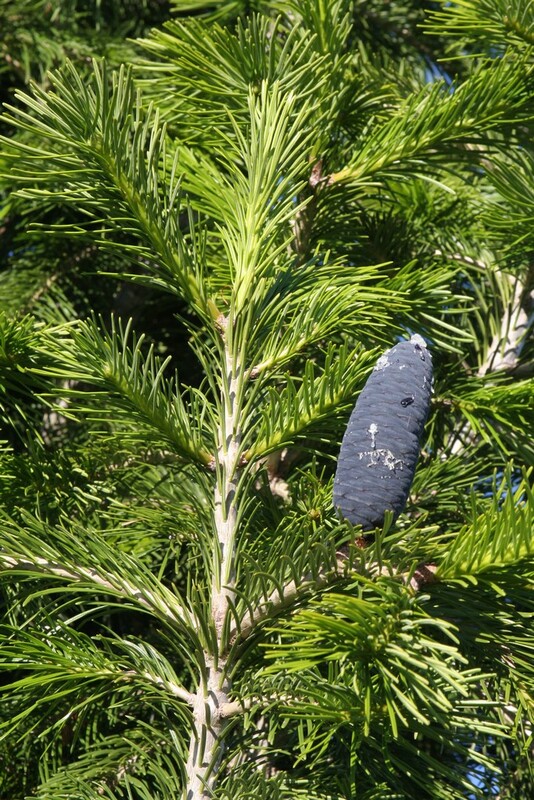 According to Rushforth in Conifers, “Cilician fir is rare in cultivation;” so rare that it is now extinct at Buchholz Nursery. 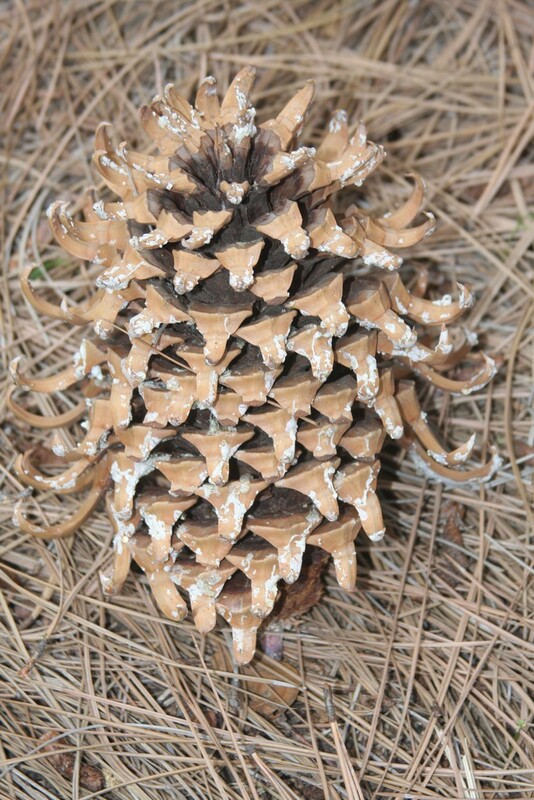 The species* is native to the Taurus Mountains of southern Turkey, and to northwest Syria and Lebanon, where there's probably an ISIS zealot behind every tree. The foliage has a “refined” look to me, with thin green needles with silvery undersides, and the cones are the longest of the genus. 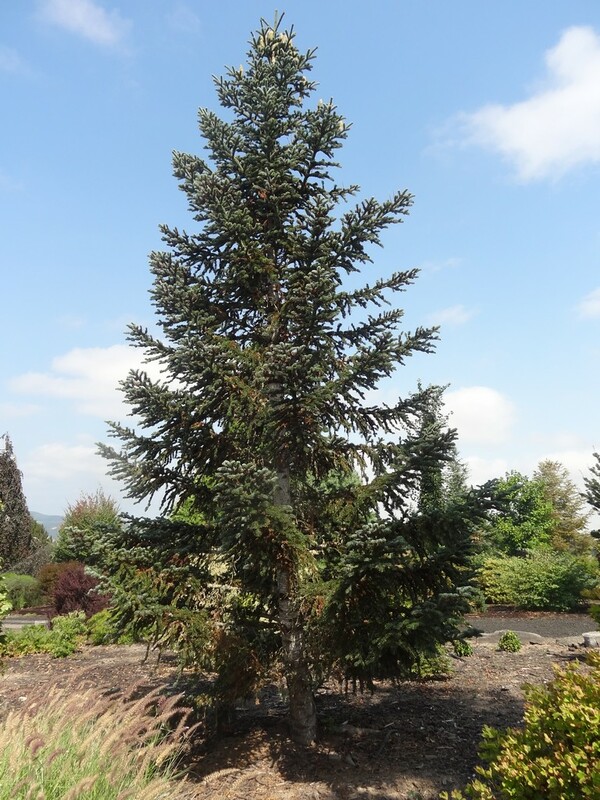 My start came as scionwood from the Otto Solburger conifer collection, located just ½ hour from my nursery. 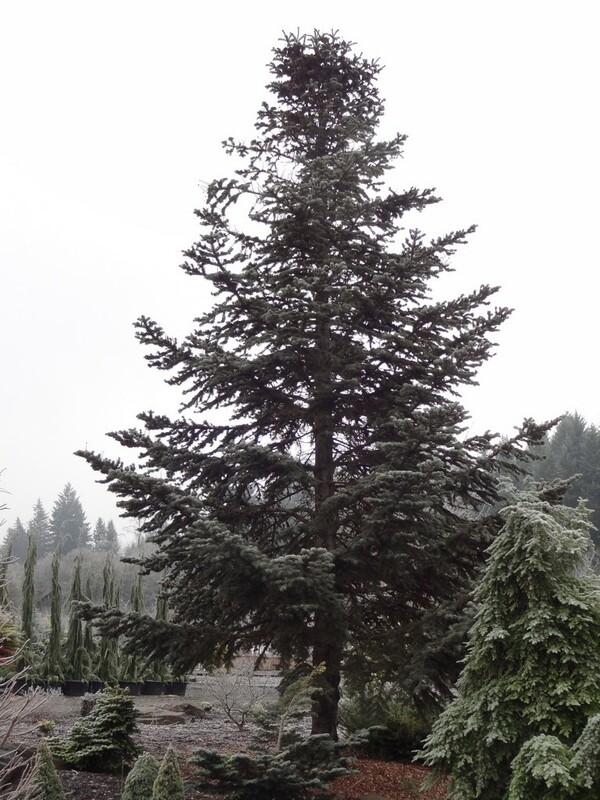 Mr. S. was a Christmas tree grower, but he also amassed a world-class tree collection, and corresponded with East Coast and European plantsmen. 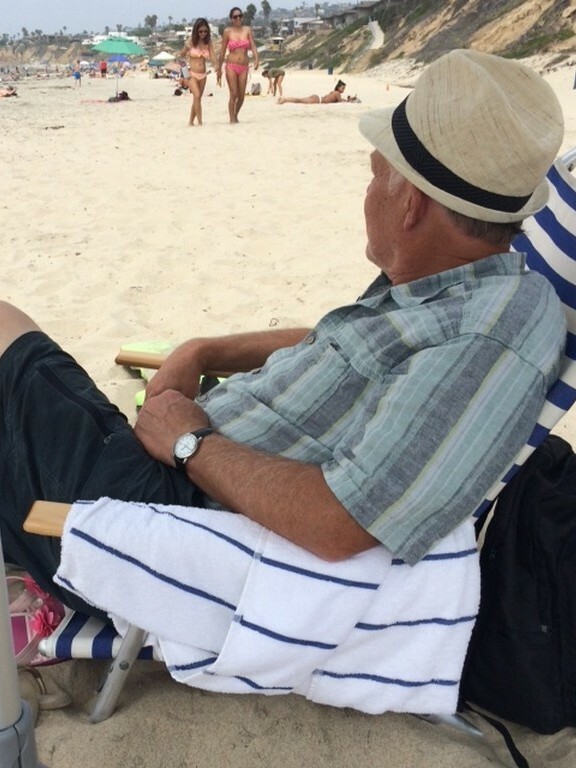 He passed away before I could meet him, but his wife was delighted that a youngster – for I was then – took so much interest in her husband's trees. 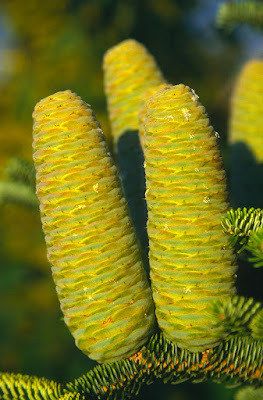 *At first I assumed that Abies cilicica was native to Sicily, but the only Abies species there is nebrodensis, native to the mountains in the north. There are only a scant few left due to deforestation, but a conservation effort is underway to save them and to replant new seedlings. Solburger's son was a logger, an authentic redneck with foot-wide suspenders and dirty pants that didn't go completely to his boots. He didn't know much about his father's trees, and probably would have preferred them sawed and loaded onto the back of his log truck. One day his parked truck was filled with Douglas fir logs, and while he was eating lunch the brakes failed and the back of the truck smashed into an Abies religiosa, sending it to fir-heaven. Fortunately its progeny lives on, for I harvested scionwood the same day as with Abies cilicica, and a specimen resides along the main road into our nursery. It is known as the “Sacred fir” as its branches are used in religious festivals and it is native to the mountains of central Mexico at an elevation between 6,900-13,500'. 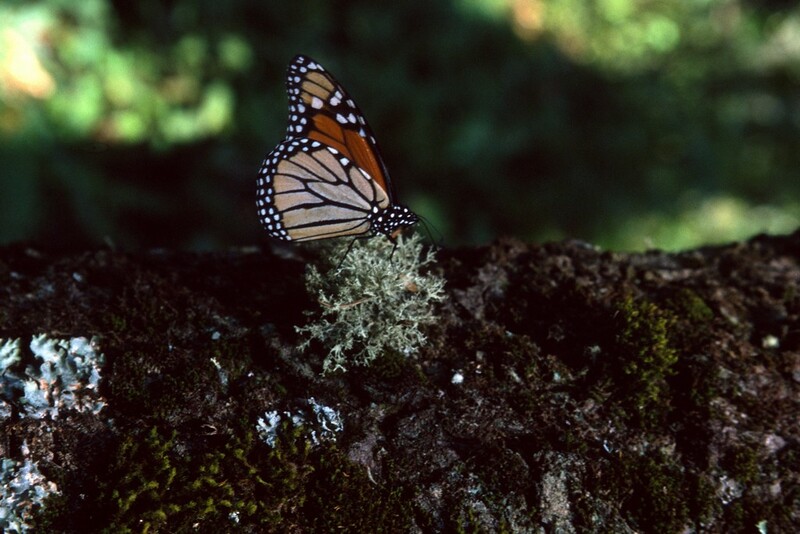 Abies religiosa is also the preferred species for the monarch butterfly (Danaus plexippus) to reside, but unfortunately the forests are being thinned for capitalistic gain at the risk to the butterfly habitat. 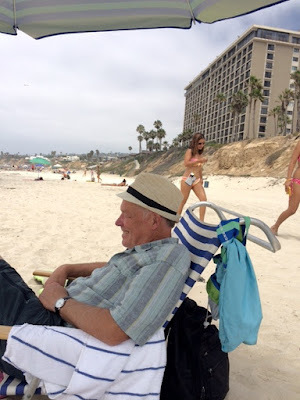 I was in Mexico in 2000 with my “Grandfather,” and we set off early for the largest congregation of monarchs. 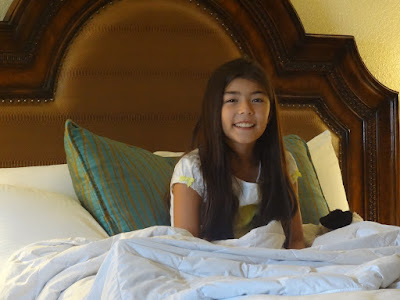 The higher one gets, the colder is the morning air, and the ground was covered with frost. We walked the path to ground zero, but the creatures were huddled in globs, thousands and thousands of them, but they were too cold to fly. Too bad for us early birds, but by the time we were ready to leave they were beginning to flit through the firs. 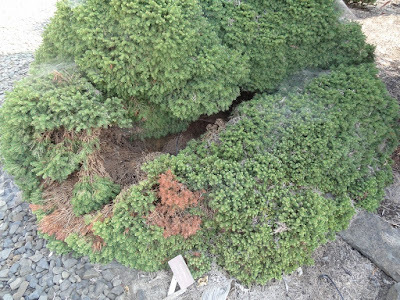 Solburger's son was at it again when he saw fit to thin out some trees in father's conifer patch. 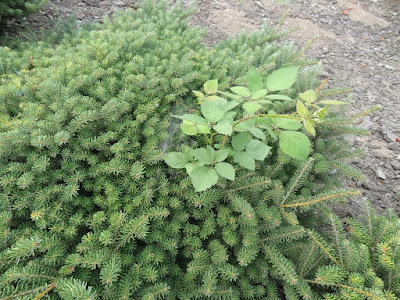 A Picea abies (Norway spruce) was vying for room with an Abies pindrow (West Himalayan fir), and the latter was removed because the son deemed the spruce as the more beautiful of the two. 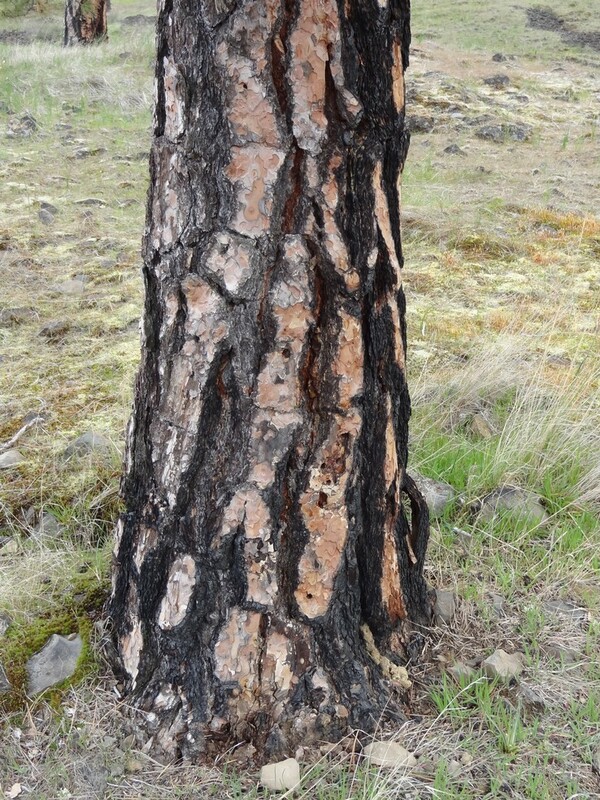 Ouch!, because A. pindrow is rare in collection, and the felled tree was probably the largest of its kind in Oregon, if not in the United States. Once again Buchholz to the rescue, and my first graft was planted in the Conifer Field at the east end of my property. It perished about 15 years ago when we had constant rain one winter and spring, and to this day I describe it as having drowned. 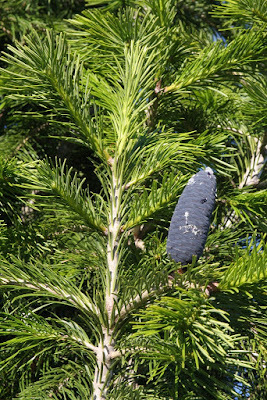 Abies pindrow was in production at Buchholz Nursery at the time, so the grandchildren of Solburger's tree – five of them – grace the Flora Wonder Arboretum, planted on a hillside with sharp drainage, and this year they are set heavily with cones. 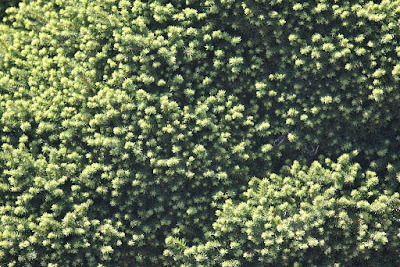 Rushforth again, claims that A. pindrow “is found in the western Himalayas from west Nepal through to Afghanistan and forms forests at between 2,000-3,000 m.” And later that “The best specimens tend to be in the cooler and wetter parts of Britain, and it is unsatisfactory in the south-east.” I'm not qualified to comment on the British range of A. pindrow, but I find it odd that my first tree drowned, if indeed they prefer “wetter” conditions. 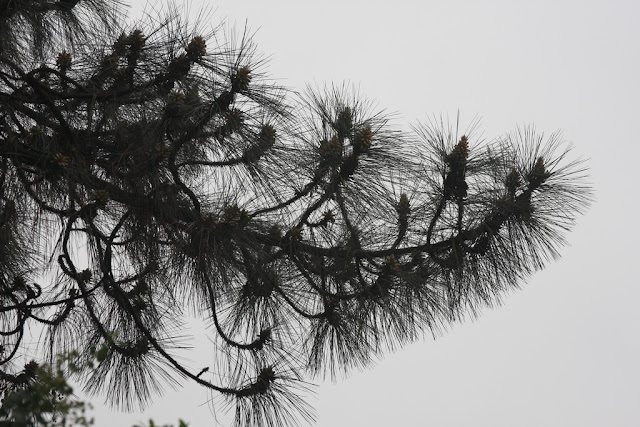 In Rushforth's Conifers he claims that Pinus roxburghii, a Himalayan tree native from northwest Pakistan to Bhutan is hardy to only Zone 9. 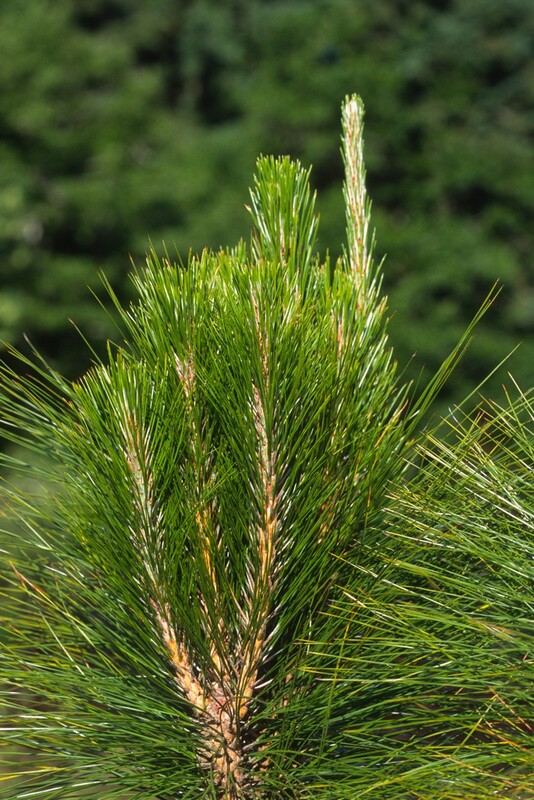 I took him to task for that comment in a previous Flora Wonder Blog, for my specimen had withstood temperatures to near zero degrees F, albeit grafted onto a more hardy Pinus sylvestris rootstock, and should perhaps be “re-zoned” to a zone 7 or 8. Well, had withstood ended last winter when the temperature delved to only 12 degrees, but it arrived in early November. Plants suffered and some died, and my rox also bit the dust. This experience prompts the old Buchholz adage that, “It's not how cold you get, but rather how you get cold.” The species name honors William Roxburgh (1751-1815), a Scottish surgeon and botanist who was based in Calcutta, and who worked for the East India Company. I became enamored with Roxburgh's pine while on a trek in northern India where I could see it in the wild, and I was most impressed with its plated bark which resembled our West Coast Pinus ponderosa. A pair of miniature spruces also faced the axe of death this month. 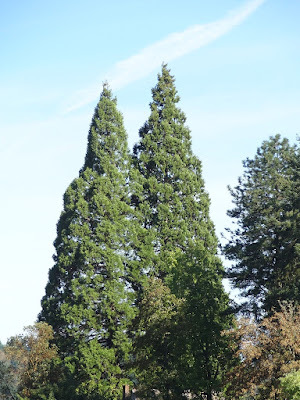 A pair of Picea abies 'Little Gem' were slightly over 40 years old, and they had grown into each other and resembled a pair of green breasts. Sadly a delivery man tried to turn his vehicle around in a tight area and backed into one, another reason my daughters will never be allowed to marry truck drivers. I've walked past the damaged tree hundreds of times, and finally grew sick enough to issue orders for its removal. So that will leave me with just one 'Little Gem', right? Well no, because where the other plant grows into the smashed tree there would be a large dead area, so out with them both. And whom do I bill for damages since I never witnessed the incident? 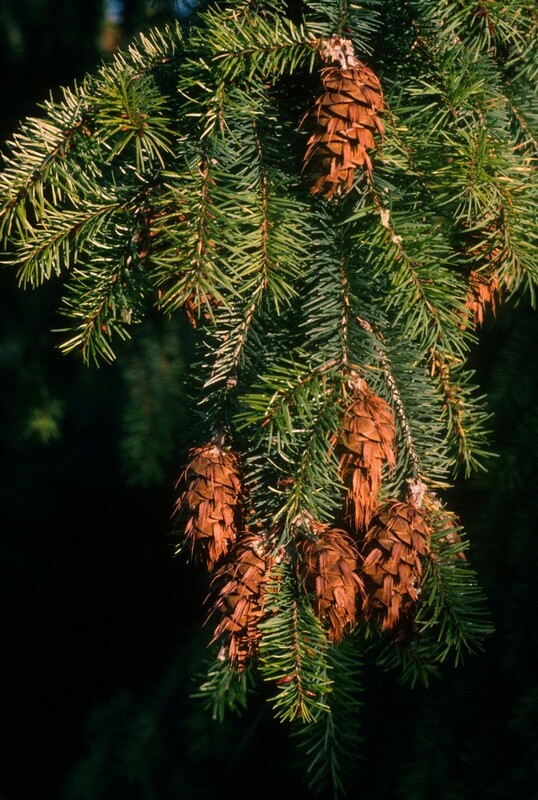 What are two 40-year-old spruce trees worth, a hundred dollars, a thousand dollars or more? They are irreplaceable, especially since I don't have 40 more years for new ones to grow. 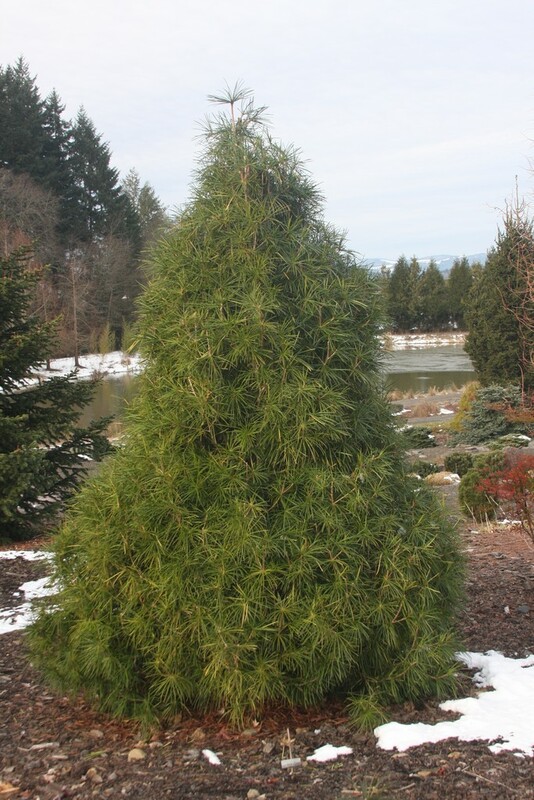 'Little Gem' is an example of a conifer cultivar that "increases" in size after 40 years. Well of course it increases because it grows. But I'm not talking about that; I mean that when you propagate you seek out the largest shoots, which are still only a half inch long. 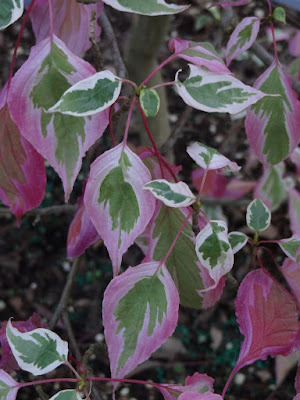 Then when you eventually propagate from the new plant, you seek out its best cuttings...over and over until 'Little Gem' becomes a larger cultivar than the original. 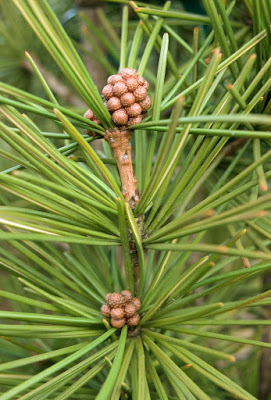 Also, if you propagate by grafting, new shoots might grow two inches long, and the rooting process is made much easier. 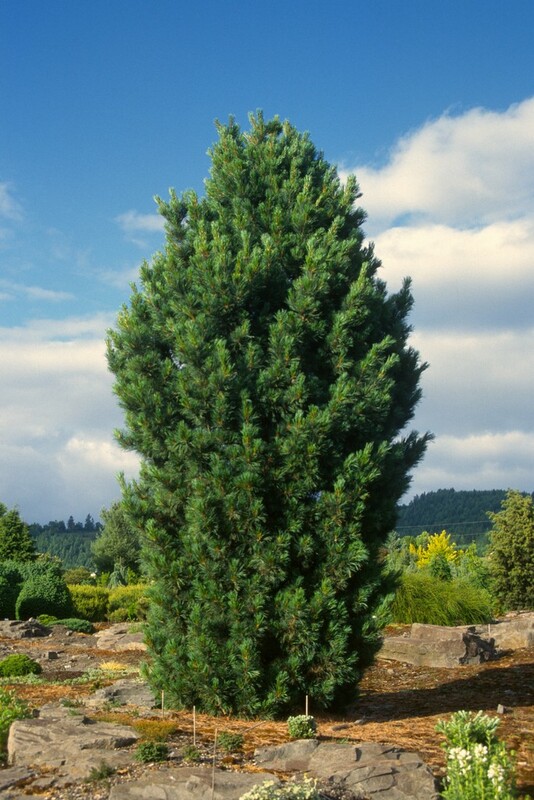 I once sold a 'Little Gem' that was grafted onto Picea abies at 2 feet high, and it had grown 5' tall by 5' wide in 20 years. At some point you have to ask, "is this forced 'Little Gem' really a little gem?" I had four Sciadopitys verticillata 'Winter Green' that were harvested from the Blue Forest and put into large cedar boxes. 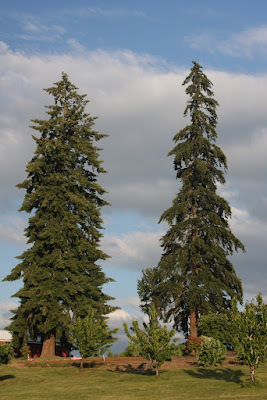 These specimens were about 18' tall, and since one doesn't hardly ever come across a 'Winter Green' so large I put a relatively high price on them -- $2,000 each. One customer dared to negotiate with me, that he would take all four for $2,000, to which I responded that they are priced at $2,000 each, and tomorrow they would increase to $2,500 each. So he walked away from the table. Last year I sold one, then this year I had customers for the remaining three. But not so fast my friend, because last month a sizeable portion on one revealed that it was dead, and to cut that out would leave me with just half a 'Winter Green', and a scrappy half at that. We dumped it entirely, but at least we were able to salvage the box. This was the first time in my career that I lost a Sciadopitys, or at least ones that were more than a couple of years old. I know some nurserymen who would spend time and energy trying to figure out the cause of death, an autopsy so to speak, but not me. Just quickly get it out of my sight. 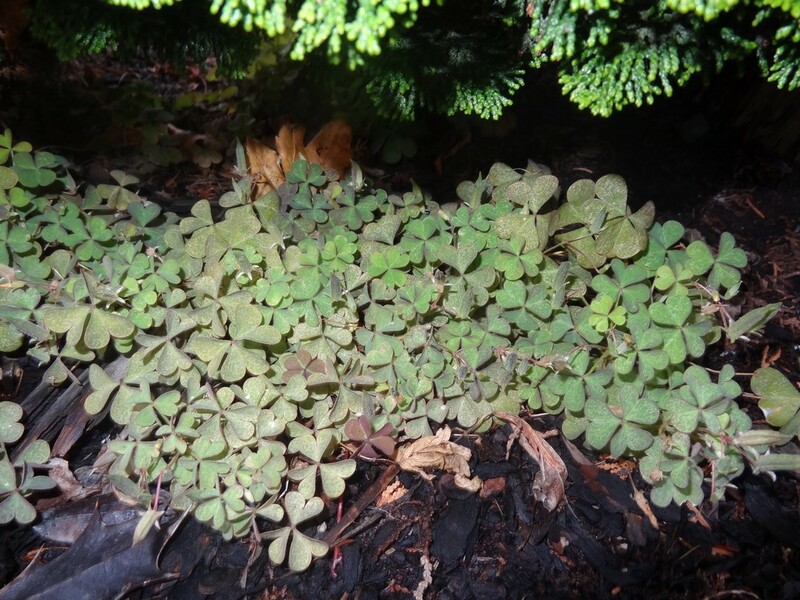 Sometimes I'll haul a plant out of the greenhouse for the dump because it is infested with Oxalis. Frequently someone will carry it back in because they don't understand why I would throw away a good tree. True, the tree is ok, but I certainly can't sell it when the pot is full of a weed that you cannot simply pull out. 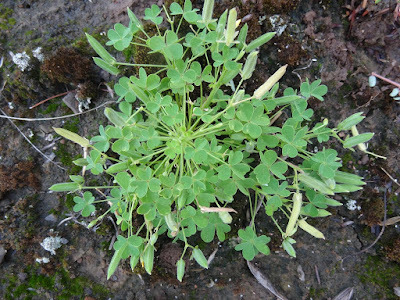 I've been battling Oxalis corniculata for years, and more recently Oxalis stricta as well. Both thrive in the nursery environment, and these perennials can spread by seed, rhizomes or stolons. If the weed has gotten into a plant of great value, we try to find time to bareroot it in the winter; however you don't always get all of the weed roots out, and they will thrive until you try again the following winter. In all I don't have to throw too many plants away, but we spend a lot of effort to catch the problem when it is small. 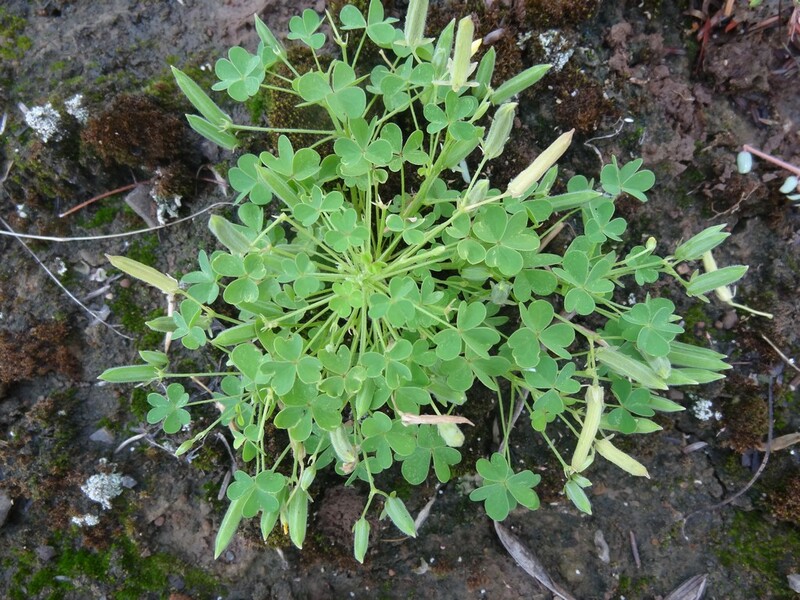 Oxalis is derived from oxus, Greek for "sour" because of the sour taste of the leaves. Another casualty at the nursery is caused by birds eating blackberries, sitting atop my specimens and then shitting the seeds close to the trunk. 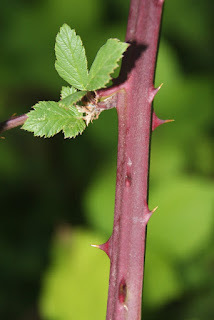 The first year the blackberry shoot might go undetected, but by the second year it can grow up to eight feet tall, and spraying with a strong herbicide would damage the tree. Once again I cannot scalp off the blackberry and sell the tree, for that would result in all of my customers leaving me. 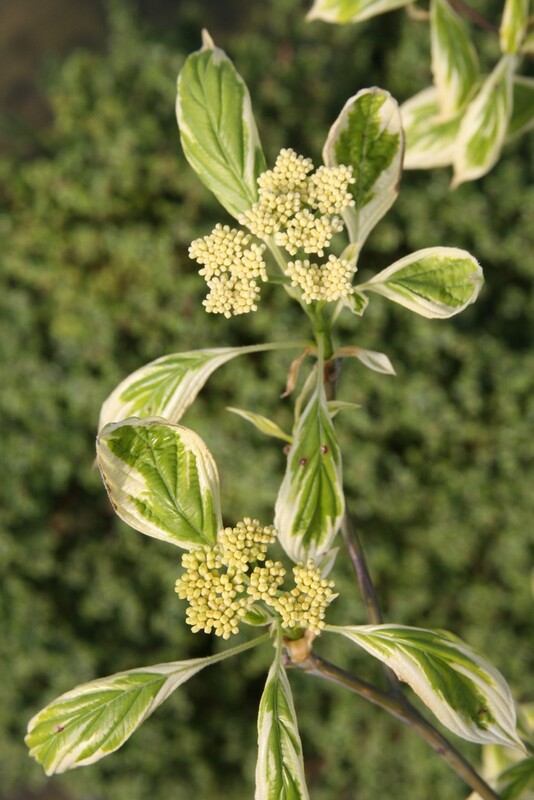 My original plant of Cornus alternifolia 'Moonlight' – discovered at Buchholz Nursery – met the chainsaw on account of a blackberry moving in. 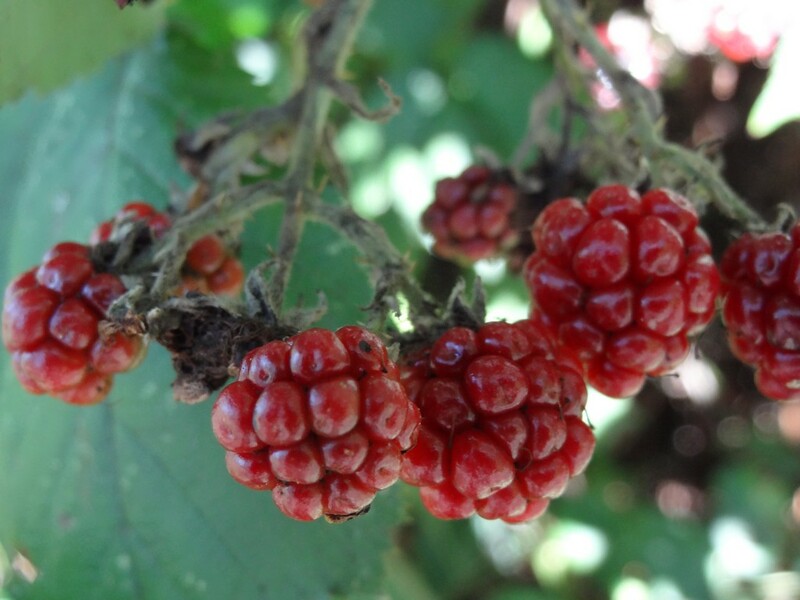 The mooch is botanically known as Rubus armeniacus, which was intentionally introduced to America as a food crop in the 1800's. 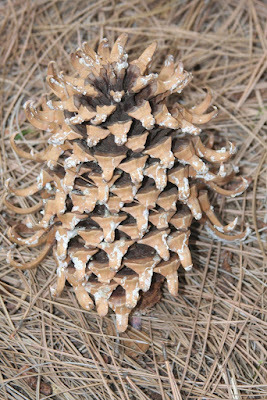 It escaped cultivation obviously, and I have it in my woods above the nursery and also at Flora Farm. There is some redeeming value to the noxious weed, however, and that comes in the form of my wife's blackberry cobbler. I'm pleased and honored that Flora has blessed me abundantly, although we don't have a perfect relationship. I think she bedevils me at times as a strategy to keep me humble, so that I won't be telling her what to do. Goodbye to all of my lost plants, for I must swallow my medicine.